Whittle Direct Books, 1990. Text/BRAND NEW. Embossed, black boards/Fine. DJ/NF w/rubs & short closed tears to upper edges & corner tips. 2nd volume in The Larger Agenda Series. LAID-IN: Statement from Federal Express, the sole advertiser for this book. Business management. Guidelines to dealing with change without destruction of already established business structure. 5 chapters: 1. The Power of Adhocracy; 2, The Right Start; 3, Off & Running; 4, Getting Results; and, 5, The Context of Vibrant Adhocracy.. First Edition, First Thus. Hard Cover. Near Fine/Near Fine. Illus. by Michele Clement (Photographer). Chicago, IL: Dearborn/Kaplan, 2000. Text/BRAND NEW. Indigo linen boards w/gilt spine lettering/Fine. DJ/NF; trace wear & faint creasing to front inner flat. Sub-title: An Inspiring Tale of How Six Sigma is Transforming the Way We Work. 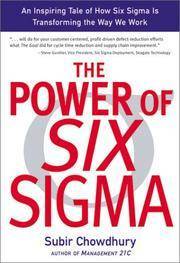 Via a fictional tale, Chowdhury elucidates the essence and power of Six Sigma --- statistical measurement of defects inhibiting productivity, increased profits, and improved customer service, advanced by General Electric's Jack Welch. Through dialogue between Joe and Larry, college schoolmates who entered the same profession (one with American Hamburger, and the other with sister company America Pizza), compare notes some 20 years later explaing what Six Sigma is all about. Fine copy.. First Edition, First Printing. Hard Cover. Fine/Near Fine. Reading, MA: Addison-Wesley, 1987. Text/Near New w/soil spot to leading text edge. Illustrated soft cover/NF w/light wear to corner tips. This the 14th reprint of 1987 reprint with corrections. Previous volume, Process Consultation: Its Role in Organization Development was published in 1969. This Volume II reaffirms the concept of process consultation, as previously defined, and introduces new concepts. 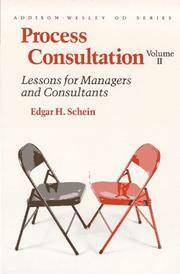 11 chapters in 3 parts: 1, Managers & Consultants as Helpers; 2, What is Process Consultation? 3, What Is "Process"? ; 4, Intrapsychic Processe - ORJI; 5, Cultural Rules of Interaction; 6, Initiating & Managing Change; 7, Who Is the Client? ; 8, Intervention Strategy; 9, Intervention Tactics & Style; 10, Toward a Typology of Interventions; and, 11, Emerging Issues in Process Consultation. Fine reference/resource for management of human processes in organizations.. Reprint w/Corrections, 14th Printing. Soft Cover. Near Fine/None as Issued. New York, NY: Oliver Wight/John Wiley, 1992. EX-LIB/UNCIRCULATED Copy. Company (Boeing) stamp to front/rear endpapers; no loan pocket or other markings. Text/BRAND NEW. Black boards w/gilt spine lettering/Fine. DJ/Fine. Treatise on management of manufacturing enterprises by author of MRP II Standard System: A Handbook for Manufacturing Software Survival. A review and assessment of current techniques and techologies augmented by innovative approaches and case studies. 11 chapters: 1, The Emergence of a Profession; 2, Major Themes in PIM; 3, Rethinking Business as Usual; 4, Sales & Operations Planning; 5, Demand Management; 6, Master Production Scheduling; 7, Material Requirements Planning (MRP); 8, Capacity Planning; 9, Plant Scheduling; 10, Supplier Scheduling; and, 11, Epilogue: The Road Less Traveled.. First Edition, First Printing. Hard Cover. Near Fine/Fine. Cambridge, MA: Harvard Univ Press, 1945. Text/BRAND NEW. Maroon linen boards w/gilt spine lettering. DJ/Poor w/chips, nips to edges, loss to upper spine & corner tips; showing surface losses and discoloration. Laid-in: digest/synopsis of contents by Harvard Univ Press. Comprehensive study of the radio as an advertising medium. Written one-fourth of radio revenue came from local advertising. Volume considers available data and offers suggestions for effective usage of the medium to increase retail sales. 13 chapters in 4 parts: Part I, Introduction & Summary; II, Radio as a Local Advertising Medium; III, Guides for Effective Radio Use; and, IV, Regional Advertisers. Fine copy in aged dust jacket.. First Edition, First Thus. Hard Cover. Near Fine/Poor. New York, NY: Quorum Books, 1988. COLLECTIBLE. First Edition, First Printing. Text/BRAND NEW. Black linen boards w/gilt spine lettering/Fine. DJ/VG; rubs, short closed tears to edges & corner tips, and small loss to upper back corner. Author inscribed, on page xv, Acknowledgments page, "Bob, Thanks for believing in me, Blake, 10/25/88"; the page has a faint corner fold. Author Blake L. White is President of Stategic Systems, a San Francisco-based technology assessment consulting firm. Drawing on successful techniques employed by his firm, Blake offers approaches to identify market oppotunities in which new technologies can facilitate. 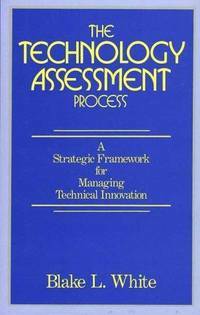 Text in 7 chapters: 1, Introduction; 2, Technology vs. Science; 3, Technological Change; 4, Technology Assessment Considerations; 5, It Will Take More Than Technology; 6, Key Technologies & the Company of the Future; and, 7, Appendix: A Review of Fundamentals. Fine copy in lesser dust jacket.. Signed by Author/Gift Dedication. First Edition, First Printing. Hard Cover. Fine/Very Good. New York, NY: Wynwood Press, 1989. BRAND NEW & Collectible. 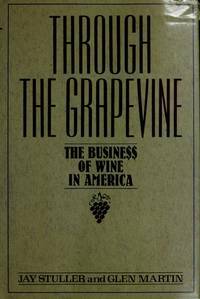 An examination of production, marketing, and finances of wine making in the United States.. First Edition, First Thus. Hard Cover. Collectible - New/New. First Edition, First Thus.